The Canary Islands are a unique part of Spain. Geographically part of Africa and politically part of Europe, it is unlike anywhere where else in Spain or the EU. In addition to being different from the rest of Spain, the islands are all different from each other as well, sometimes having radically different landscapes and geographies. 1) They were NOT named after the canary birds. Despite the name, the islands were not named after canaries, the cute, chirping birds. It comes from the Latin word for dog, “canaria“. One story is that when some of the first Europeans arrived, they found large dogs on the island of Grand Canary. In fact, they might not even be named after dogs at all, but rather after seals which used to inhabit the island, which the Romans called “sea dogs”. 2) It has the highest point in Spain. Despite having the Pyrenees mountains in its country, the highest point in Spain is actually on the island of Tenerife. El Teide is 3,718m (12,198ft) high. There are other tall peaks in the Canaries as well including Roque de Los Muchachos on the island of La Palma 2,400 m (7,874 ft). This mountain is of note because it is home to one of the largest collection of astronomical telescopes in the world, including the world’s largest telescope, the 10.4m Gran Telescopio Canarias. Its high volcanic mountains which sit above the clouds makes it similar to the observing conditions you can find in Mona Kea in Hawaii. 3) The Spanish Civil War started here. At the outbreak of the Spanish Civil War in 1936, Francisco Franco was the General Commandant of the Canaries, headquartered in Las Palmas, on Grand Canary island. He and his minions plotted their strategy here in the Canaries, out of sight and mind of the rest of Spain, before moving to the continent. 4) You can cook food over a volcano. As I mentioned above, the Canary Islands are volcanic in origin. While there are no volcanoes currently erupting on the island, there was a great deal of activity on the island of Lanzarote between 1730 and 1736 when over 100 volcanoes appeared on the landscape. The last eruption was in 1824, but there is still a significant amount of heat just below the surface. If you enter Timanfaya National Park, you can visit El Diablo Restaurant where they have several demonstrations which show the heat just below the surface. In one demonstration they toss straw into a hole which bursts into flame due to the heat. In another, they pour water down a whole which instantly turns into a tower of steam. At the restaurant, there is a 9m hole was which was dug to access the heat, the top of which is used as a grill. The temperature of the grill reaches 400C and uses no energy. 5) The islands were colonized concurrently with the Americas. While the Canary Islands were known to the ancient Romans and Greeks, they never really grabbed the attention of Europeans until they began to sail across the Atlantic to the Americas. Columbus used the island of La Gomera as a staging point for his first trip to the Americas. Most of the older buildings you can find in the islands, especially in the city of La Laguna are very colonial in style. Unlike the Americas, however, the Canary Islands were not a colony but an actual part of Spain which they remain to this day. If you remember the Alamo, then you should also take a second to remember the Canary Islands. The city was originally founded by settlers from the Canaries and their descendants died fighting alongside Jim Bowie and Davy Crocket. The founder of the city of São Paulo, Brazil is also from the island of Tenerife. On the island of La Gomera, there is a language used to communicate over the large distances across valleys called “Silbo Gomero”. As technology changed the ease in which people could communicate, the language was in danger of dying out in the 20th Century. The government took measures to teach the language to children in school. The whistling is actually just a form of Spanish. The language is more used for announcements and news, not for personal conversation. It was listed as a “Masterpiece of the Oral and Intangible Heritage of Humanity” by UNESCO in 2009. 8) The Canary Islands had the world’s worst airline disaster. The world’s worst aviation accident occurred on the island of Tenerife on March 27, 1977, when two Boeing 747’s collided on a foggy airport runway. 583 people were killed when KLM Flight 4805 hit Pan Am Flight 1736 during take-off. Neither plane was supposed to be on Tenerife as they were diverted from Gran Canarias when a bomb was detonated on the runway. The airport had many more aircraft than it could handle and couldn’t fit all the planes at the gates. An investigation after the event by Spanish, Dutch and American teams concluded that there were a host of problems which lead to the disaster including language, not knowing where the planes were, casual terminology and pilot error. The accident led to a host of changes in how plane crews and flight control towers talk to each other to avoid misunderstanding. 9) The Canary Islands has two capitals. The province of the Canary Islands has capitals on the two largest islands of Tenerife and Gran Canaria. Santa Cruz on Tenerife and Las Palmas on Gran Canaria are both jointly considered the capitals of the province. Santa Cruz is where the Canary Island Parliament sits. 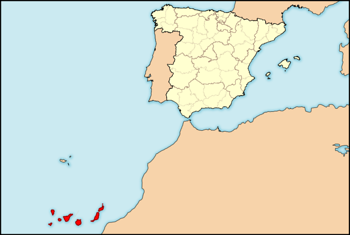 The two capitals date back to when the islands were two different provinces of Spain, with each city serving as capital. When the provinces were merged, they both continued to hold the title of capital. 10) Tex-Mex cuisine can trace its roots back to the Canary Islands. As noted above, many of the settlers of Texas and Mexico came from the Canary Islands, and almost all of the Spanish conquistadors came through the Canary Islands on their way to the New World. Along the way, they brought with them many of their food. The use of peppers and chilies originally came from African Berbers to migrated to the Canary Islands and infused the food their with their flavors. Other things such as the use of sauces, which in the Canary Islands are called mojo sauce, later became the basis of the sauces and salsas which are found in Tex-Mex cuisine. 11) The Canary Islands has its own form of wrestling. Lucha Canaria is the name of the traditional form of wresting on the islands. It is sort of a cross between Greco-Roman Wrestling and Sumo Wrestling. The traditional wrestling aspects come from the grappling, and the sumo aspects come from the round circle they fight in and try to throw each other out of. 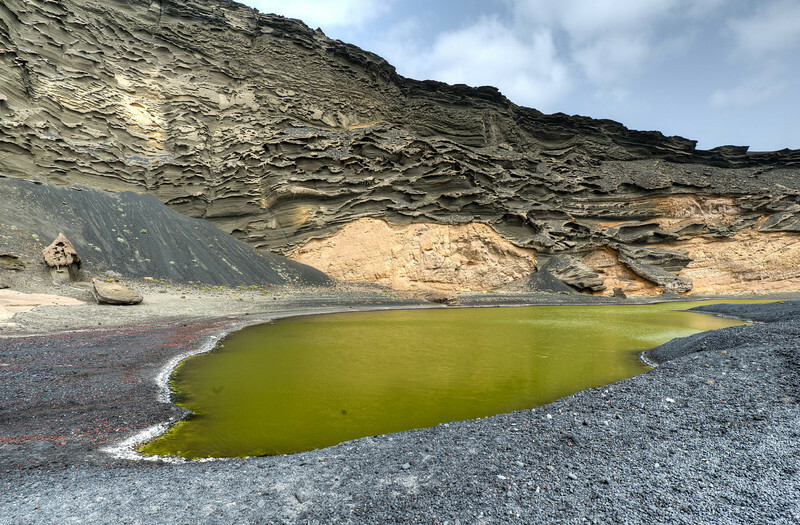 12) The water in Lanzarote’s El Golfo crater is green. The El Golfo crater is a volcanic crater which is on the shore of the island of Lanzarote. Inland just a few meters from the coast is a pool of water which has developed a green hue. The green comes from an algae which live in the salt water in the pool. The water in the pool is still connected to the ocean via underground fissures, which keeps the water at sea level, and ensures that the pool does not evaporate away. 13) The Canary Islands has been a filming location for many Hollywood movies. 14) Lanzarote has some of the oddest vineyards in the world. Lanzarote is a volcanic island that has almost no soil or natural vegetation. To grow grape vines there takes quite a bit of effort. 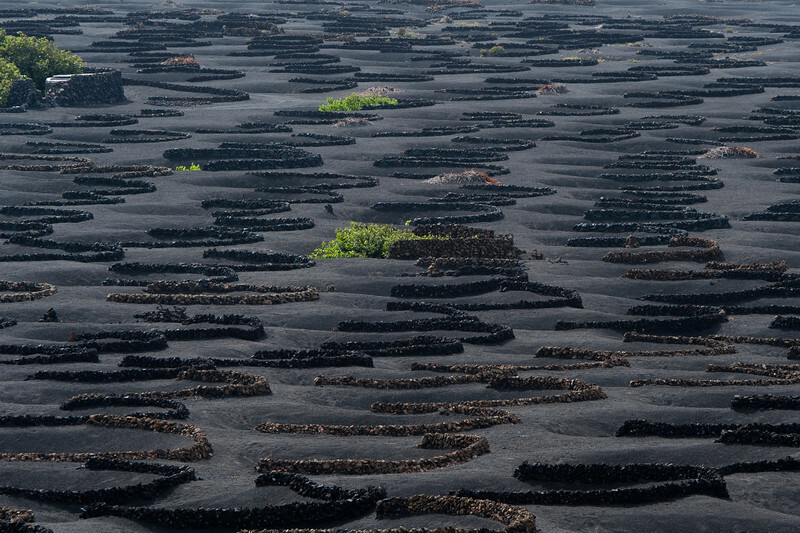 Unlike most vineyards where the vines are planted in rows, on Lanzarote each vine is placed in a small depression with a semicircular wall of lava stone around it to protect it from the wind. The roots are in the lava rock where they get moisture from the moisture which condenses on the rock. 15) The Canary Islands used to be home to a species of giant lizards. Prior to humans settling on the islands, there were lizards called the giant Gallotia which were about the size of a modern-day monitor lizard. There are Gallotias on the island today, but much smaller and relatives of the original giant lizard. 16) Admiral Horatio Nelson lost his right arm in the Canary Islands…..literally. On July 22, 1797, Horatio Nelson led an amphibious landing to attack the port of Santa Cruz on the island of Tenerife. The attack was a disaster for the British. The attack was repulsed with 250 British dead and 128 wounded, vs only 30 Spanish dead and 40 wounded. When Nelson was shot in the arm, he was rowed back to his ship where he famously said, “Doctor, I want to get rid of this useless piece of flesh here”. The arm was removed and thrown overboard. Every year till this day the people on Santa Cruz celebrate the battle. 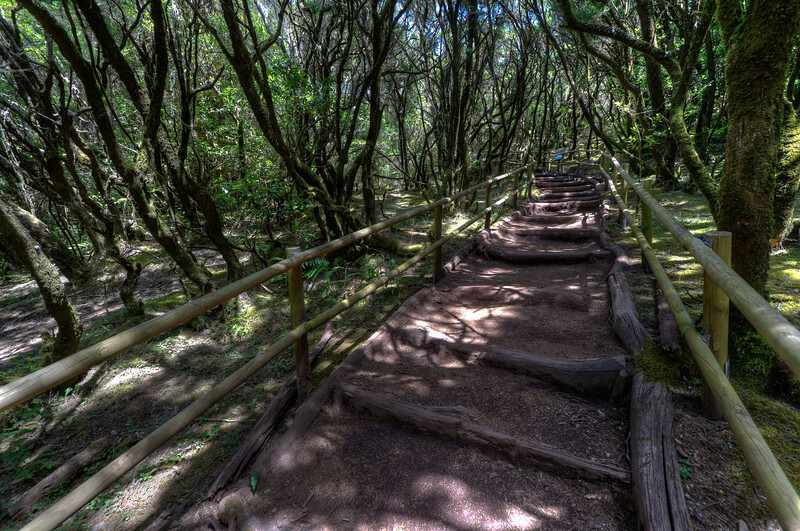 17) The Canary Islands is home to 3 of the UNESCO World Heritage Sites in Spain. Vinas. Was this a common practice in that area? Thank you Dr Vicente Barreto for your great contribution. This post had so many inaccuracies that pissed me off until I read your comment. There not ‘African Canary Islands’ . And to gain a VISA you must go through the Spanish Consulate so YES they are 100% apart of Spain. And No, No one in Australia has heard of them, I am constantly explaining about them to people. Cooking food over a volcano is one of the craziest thing I have heard in my lifetime! Drilling and putting a pipe into its surface can become really risky at times I suppose.Anyways this is a fabulous post! The truth about my country, the African Canary Islands. 1.- Yes, they were not named after birds or dogs. The people of the Canary Islands came from Berber tribes in North Africa. One of these Beber tribes was called “Canarii” and therefore the name of my country is “Islas Canarias” (Canary Islands). In short, the name has to do with one of the Beber tribes and not dogs, cats or birds. 2.- It does not have the “highest point in Spain”. Mount Teide, in the island of Tenerife (Africa), is 1,400 kilometres from Spain (Europe). In short, we are talking about different realities: one country is in Africa and the other in another continent (Europe). It is like the French saying that their highest mountain is in Algeria. Well, my friends, Algeria is closer to France than the African Canary Islands to Spain. The Canary Islands is a COLONY of Spain in Africa and we, the Canary Islands, want the Spaniards out of our country. 3.- The African Canary Islands were invaved by Spain before the Americas and later they used the Canary Islands as a stopover in order to bring death and terror to the Americas. The Canary Islanders war with Spain lasted nearly 100 years and after the Spaniards “discovered” the Americas, needing our Islands to provide food, water, etc., for their ships, they signed agreements with our people saying that they would respect our lands, people, etc. Of course, since they were pirates, they did not respect the agreements signed with us. 4.- Yes, the City of San Antonio and other places in the Americas were founded by Canary islanders. The “troblemakers”, those Canary Island patriots that resisted the Spanish pirates in our islands were rounded and transported to the Americas. Something similar with the English transporting children, young girls, etc., to Australia to help their cause in Australia. 5.- Yes, dictator Franco, “by the Grace of God”, was in exile in the African Canary Islands. Spain always used its colony of the Canary Islands to transport its own troublemakers far away from Spain and so Franco, Unamuno, etc., spent time in the Canary Islands. One day, during Franco’s period of exile in the African Canary Islands, a small plane piloted by an English guy lands here and takes fascist Franco out of the Canary Islands and on his journey back to Spain to create trouble. I don’t know why the English seem to be always in the picture. If the inglés (English) had not landed in the Canary Islands, he would have saved Spain from Hitler’s litter brother (Franco). Finally, boys and girls, Madrid says that the Canary islands is “Spain”. etc. Well, France also used to say that “Algeria is France”. As for those who say that the Canary Islanders “love” Spain, are “Spanish”, etc., they are Spaniards living in the Canary Islands as part of the colonial administration. Spain has caused too much pain, misery, poverty, crimes, rapes, death, etc., against our people -the Canary Islanders- for us to love them. Will the Canary Islands be free of Spain one day? Well, if nothing in this life is permanent then I believe that one day the Spaniards will have to leave the Canary Islands. After all, the Spaniards love Spain too much and claim to be europeans, etc., and our islands are not in Europe. It would be much better for them to live in their beloved Europe and leave the Canary Islanders in peace. Their enemy is: geography and time. Finally, our islands receive 12 million tourists every year but our people leave in poverty, the unemployment rate is 30% and for our youth 60%. Why? Because Spain controls our economy and steals the billions generated by the so-called “tourist industry”. The best jobs are occupied by people from Spain. If this is not bad enough, the flora and fauna of the Canary Islands is suffering because our islands have too many people (residents + tourists). There is a mistake in the post. General Franco had his headquarter in Tenerife, not in Gran Canaria, next to “Plaza Weyler” in Santa Cruz de Tenerife. Tenerife is the capital of the militar zone in Canary. On the other hand, the Civil War did not start in Canary Island, it started in North Africa at the city of Melilla . One day later Franco left Tenerife by plane to Africa to command the army in Africa (the plane was called “Dragon Rapide”). He was not the leader of the rebellion. The leader was General Mola. I love these posts. You always find some pretty strange facts. 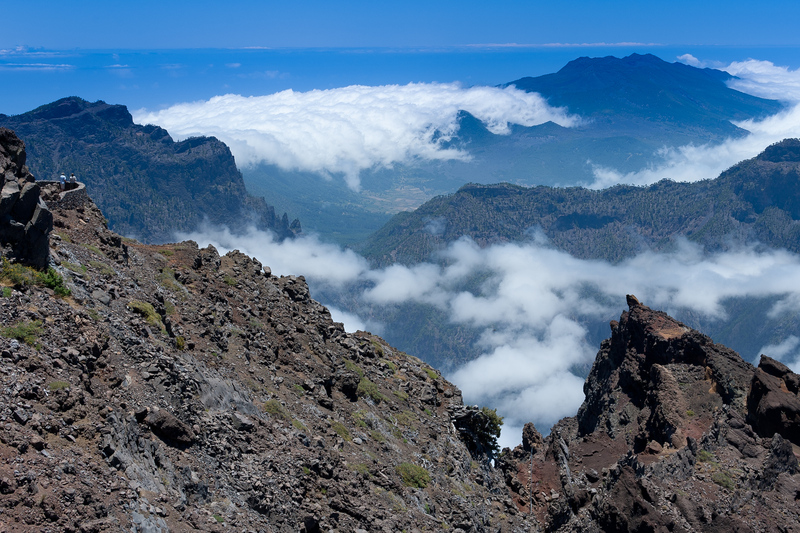 Very good article but just a correction: La Palma is 2,426 meters high. 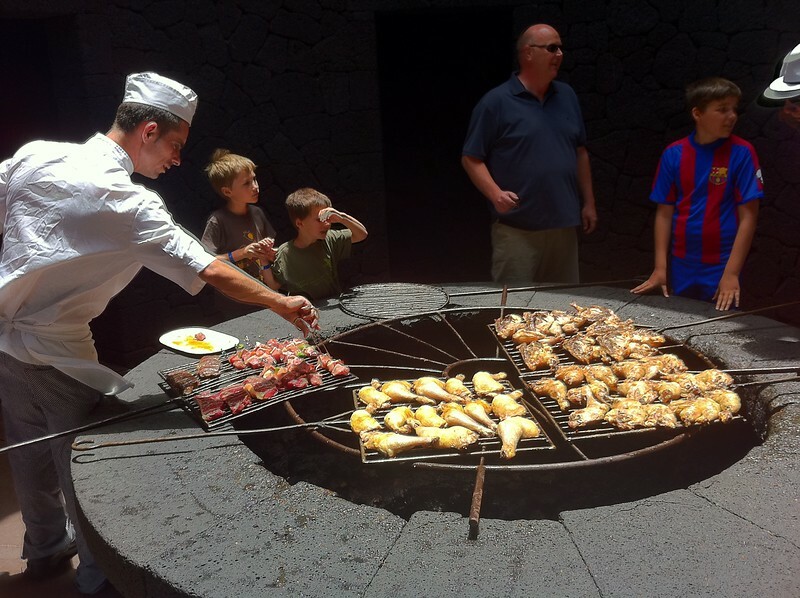 ooo….you can cook on a vulcano , very interesting ideea … i never heard about something like that … Canary Islands seems to be a good choice for my next travel . Wow! Volcano bbq. How green! I would be afraid of it erupting while I waited for the food though. named after dogs and not birds.. how interesting. SCARY no.8 tho!!! That they were not a colony but a part of Spain is debatable. The Organization of African Unity (OAU), former African Union, already said at 1970 that Canary Islands were an African territory waiting to be decolonized. I’m not sure why a 41 year old proclamation from an outside group matters. 1) They are a part of Spain. it is recognized as such by the international community. They are a province of the country and have representation in the Spanish parlament. 2) No other country claims the Canary Islands. 3) There are no movements for independence. 4) There are no native groups. What people were here have been mixed into the general population who mostly came from Spain. 5) They are not had have never been listed on the United Nations list of non-selfgoverning countries. Great post Gary… excellent info! When visiting there… how many of the islands would you recommend visiting… is there just one or 2 main ones to go to or like somewhere like say Hawaii is there 5 or 6 nice ones to check out? It was a long time ago, Andi, and thereafter they built a new airport, which is now the main one. Once that was open they installed all state of the art stuff and completely remodelled. For a while it was used only for cargo and inter-island traffic, but the majority of international flights now come into the southern airport (I should know I live almost at the end of the runway!). So don’t be put off!!! I have eaten from that BBQ many times. The salty potatoes being my favourite. Some fascinating tidbits but the part I enjoyed the most was the volcanic bbq. Wow! Cooking food over volcano!! Never heard of that!! The 9th thing would have to be the Observatory, Roque de los Muchachos, in La Palma. Statistically it´s second only to the one in Hawaii for optical and infrared astronomy in the Northern Hemisphere. Also it current holds the record for largest single-aperture optical telescope. I know that on La Palma as well as Lanzarote the government has put in place so laws that protect though regions for light polution, making them wonder sites for star gazing! Normal summer weather here, Gary! Sorry, couldn’t resist that. Nice to read something factual and accurate. Since the main islands of the archipelago are “hot” tourist destinations for Europeans thousands of words are written annually, and many of those are inaccurate. I took a small poll recently of people from New Zealand to mainland Spain, and it turned out that around 75% didn’t know where the islands are until recent months, and I’ve actually spoken with British tourists who thought that they were in the Med! That video is the best I’ve seen. Presumably you’re talking about from your part of the world Gary. The Canary Islands are one of the most popular European holiday destinations and are visited by millions of people every year. Tourism here seems to be from a few select places in Europe: Spain, UK, Germany being the biggest ones. I’ve also seen some Russians and Swedes. Once you get beyond those and maybe a few other countries, I’d say most of Europe is probably just as clueless as is Australia, Asia, etc. The same can be said for many other popular tourist destinations in the Caribbean or the Pacific. Many Australians visit Vanuatu, but I doubt if most people know much about Vanuatu. 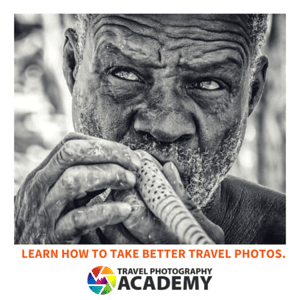 Vanuatu and the Canary Islands – that’s an original comparison for sure. When you’ve been to as many places as I have, you see comparisons and similarities that most people probably wouldn’t realize. I noticed some similarities between Lanzarote and Aruba for example. The thing is that you didn’t go to the main “tourist” places. The majority of people come for the sunshine, beaches and bars, which may not be your kind of travel, but whatever turns them on. They simply come, soak up the sun and leave, and never see the things you have seen, or which Jack and I write about. I walked along a tourist beach this week (a novelty for me!) and apart from the nationalities you mention I heard French, Italian and other Skandinavian languages I couldn’t name. The Russian market is big business here these days, but most stick to organized groups and excursions, and they are one of the few groups of visitors with money to spend.